Refurbishment and conversion to create a new concept hotel, Tuscany. Welcome to a new type of luxury hotel. Moving away from gold taps and endless fluffy white towels, this design caters for the guest who prefers to relax in beautiful surroundings and enjoy the simple, yet best things life has to offer. 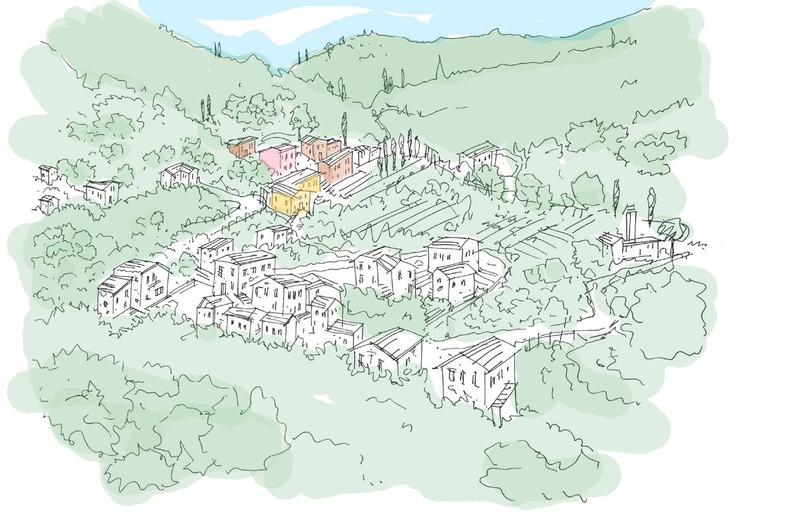 In our proposal for this new concept hotel, set in picturesque Tuscan countryside, we will refurbish three old buildings, two 17th century villas and an old convent. Each element of the hotel will be akin to our values and those of the client, utilising local materials and sustainable, clean energy. Guests will have the opportunity to retreat from the fast pace of modern life and enjoy excellent organic produce in one of three on-site restaurants. Or they could visit and buy food from the integrated local market, to prepare in a residence that is more akin to a home from home. Comfortable, stylish, private and homely – a far cry from the corporate hotel room. The plot is divided into different leisure areas, each working in harmony with the natural landscape.